Home > Electrical, Maintenance & Cable Management > Plant Maintenance Signs, Labels & Tags > Maintenance & Electrical Tags > Do not use tag. Do not use aluminium foil labels. Do not use out of order tag. Do not use write and seal labels. 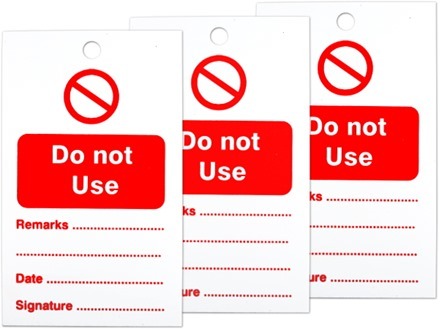 Do not use tag for attaching to equipment, machinery and plant. Semi-rigid plastic. Supplied in packs of 10 tags. 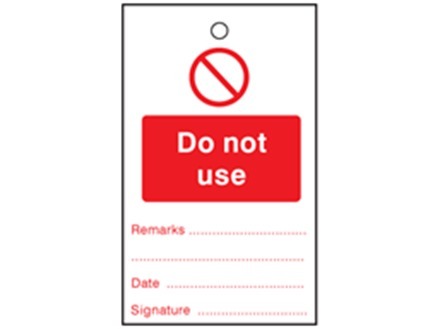 Do not use tag, for maintenance and electrical inspection of equipment, machinery and plant. Supplied in packs of 10 tags. MST100 Size 100mm x 60mm. Material semi-rigid plastic.